The corridor at the top of the stairs has a timber floor. Rowaine peeks around the corner and sees an L-shaped corridor with a series of doors in its walls. The party creep up to the first set, a double door on the right wall. The doors bear the image of Erastil, a nature deity often revered by the likes of druids and rangers. Jakardros identifies the room as the Black Arrow's chapel, mentioning that Erastil is the order's patron deity. It is quiet beyond the door. "What are the other doors?" asks Feren. "The next set of double doors further down on the left is the Tribunal," Jakardros whispers, "where important decisions are made. Or should I say 'were made'. The single door at the end of the corridor leads to Captain Lamatar's personal quarters." Feren opens the chapel door and those nearby immediately notice that the scene before them is very, very wrong. Once-magnificent trophy antlers along the walls are now draped with rotten flesh and coils of viscera. A huge pile of dead men are piled on the altar recessed in the opposite wall. The symbol of Erastil has been thoroughly defiled in every way imaginable - sight, smell and creeping dread confirm that. A three-eyed jackal has been crudely painted on the wall above the altar. Arrian recognises the symbol, used by followers of Lamashtu, goddess of monsters. 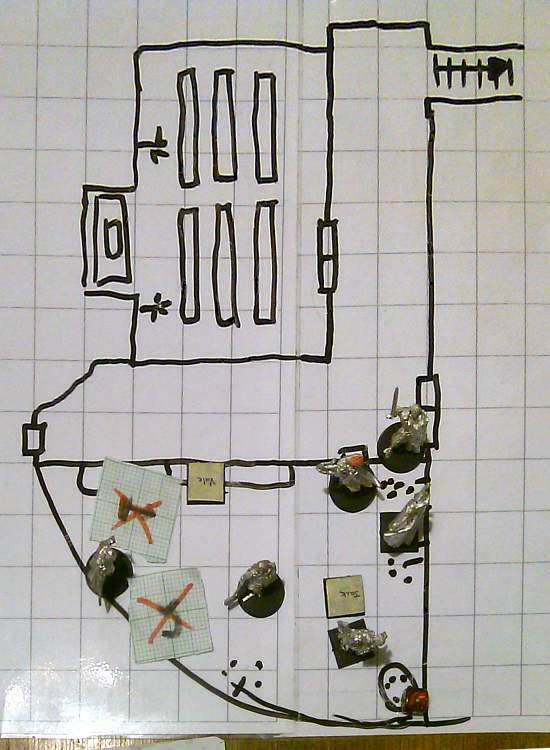 In the far left-hand corner sprawled over two rows of pews is the largest ogre the party have yet encountered, calmly stitching the arms and legs of a ranger onto a horse. It looks up at the intrusion and doesn't look very happy. Yeran makes a bold prediction: "We'll kill the ogre before it moves." Emily activates her magical necklace's False Life ability before firing three arrows. Two lodge in the ogre's torso, one bounces off its bracers. Feren somersaults between pews, closing to striking distance. He favours defence over accuracy, wary of the huge brute, but its seeming surprise at the manoeuvre makes the strike relatively easy. Fully half of his keen rapier's blade sinks into the ogre's stomach. Arrian butchers Tennyson casts Recitation, then moves into the room. Shalélu steps closer to the doorway and fires three arrows. The first pierces its cheek and the following two strike high on its chest. Vale takes in the carnage and defilement, screams an unintelligible battle cry and strides in, seeming oblivious that his enemy is two and a half times his height and probably 1500 pounds heavier. He arcs his battle axe up and buries its head in the creature's inner thigh. Troll follows up this flurry of violence with a Fiery Burst. Flame briefly engulfs the ogre and it collapses, dead. Vale continues to hack away at the felled creature. Jakardros quitely approaches and lays an understanding hand on the ranger's shoulder. Vale lets up, but fury continues to rage in his eyes. He leaves the room. Arrian takes stock of the creature's possessions: a massive ogre hook, spiked bracers, a very large belt holding up a loincloth and a sack containing two potions. Troll casts Detect Magic; only the loincloth and sack are nonmagical. Arrian wraps the twice around his waist. It writhes in his hands, shrinking to a perfect fit. He does up the clasp and immediately feels … really good. Like he could smash his hand right through that pew over there. He tries lifting the end of the pew and finds it surprisingly easy. He takes the belt off and offers it to Rowaine. "Try this on. It makes you really strong!" Rowaine tries the belt. Again, it writhes snakelike until it is the right length to encirle Rowaine's waist. "I see what you mean!" she says, swinging her heavy waraxe. Emily lifts the spiked metal bracers, wondering what use they might be. She places her way-too-small forearms inside and starts as they too shrink to fit. The group proceed to the corridor's bend where there are two doorways. Emily inspects the double doors leading to the Tribunal. Each bears the insignia of the Black Arrows, and scars of piercing and slashing weapons. The right door has a keyhole. She can hear guttural laughter behind the door. Blink is going nuts in her head. Rowaine and Emily also hear a deep female voice punctuated by metallic clanging coming from behind the single door. Troll casts Spider Climb while Emily looks through the keyhole. Inside the large room is the shattered remains of what once was a sizeable table and set of chairs. Two ogres guffaw at each other as one plays with a strung-up headless human corpse, alternating batting it with its oversized hand and wringing its blood and gore into a bucket beneath it. Arrian checks the other door, looking through its keyhole. A brazier stands near the opposite wall which is slightly concave. To the right, a huge, ugly female ogre argues with a male, occasionally slapping its face even though she is considerably smaller than he. The blows ring with a metallic timbre; the male has a jaw made of iron, complete with jagged metal teeth. "That's quite a lot of ogres to deal with," says Arrian. "Feren, can you lock one of the doors?" Feren winks, gets out his lock picks and fusses with the lock on the tribunal door. His smile slowly dissipates as the lock will not accede to his prowess. He simply cannot work out this lock, even starting to believe that perhaps this is a fake keyhole. Eventually Emily challenges him to a race - who can lock one of the doors first? Feren finally hears a very satisfying click and inches a small internal bar into the adjacent door. Feren tried that lock thirteen times. The party gather around the southern door. Arrian casts Recitation again and Rowaine opens the door. Feren performs what is becoming his signature move: stalk forwards and drop into a tumbling roll, finishing with a rapier stab. His weapon is aimed at the female ogre. It strikes true and deep. Does he have tumble on the run? Emily moves into room and looses two arrows from one bowstring. They both fly on diverging paths, neither coming close to their target. Her pseudodragon scurries into the room, looking to disappear behind the brazier. "Mooooore!" bellows Vale. "None shall stand!" He charges in towards the male, chopping deeply into its exposed calf. Troll enters the room, notes that the ogres are adjacent and Fiery Burst both of them. Arrian casts Magic Vestment on Rowaine while Jakardros puts an arrow into the male. Shalélu follows up with an arrow of her own. The female defensively casts a spell that Troll identifies as Shield. Rowaine stands shoulder to shoulder with Vale and smites the male ogre, a telling blow. "Hur!" it shouts. Its vicious hook spears into Rowaine. The ogre rips its weapon free, tearing the wound wider, then it slams the blunt outside edge into Rowaine's head. She reels from the pain. Feren weaves around the female, causing her to lose her balance. He stabs her through the back of the knee. While Blink slinks behind the brazier, Emily buries another arrow in the she-ogre. She drops back a step. Vale moves with her, chopping with deadly force. The ogress falls. Troll finishes off the remaining ogre with a Fiery Burst. Arrian inventories the two ogres' gear. The female has a wand, a dagger, an amulet and a cloak. Arrian's Detect Magic reveals that all but the dagger are magical. The male's armour and hook are magical, as is a potion it carries.